We hitched out of Hanmer Springs with our bellies full of fish and chips (and maybe some chicken curry pie, too). The days are long still, and it's light until well after 9pm, so even after arriving back at the trail around 4pm, we still had plenty of time to hike. The first few miles were dusty and dry (I had a bit of a nosebleed, actually -- it's not all fun and games out here, you know!). This was the last time we'd have dry feet for several days. We found a beautiful campsite next to the river and had it all to ourselves. The sun was just starting to set as we cooked dinner, and though the sandflies were getting aggressive, we decided to have a scenic meal out on the bank. We're supposed to be enjoying the great outdoors, right? Well, about three bites in, we both admitted that the sandflies were driving us out of our minds and we sought a less scenic refuge in the tent. Once you defeat the small army of them that followed you into the mesh, the tent provides a decent safety zone. We ate the rest of our mac and cheese in peace; sometimes the outdoors is overrated. Things started to get swampy early the next morning as we hiked along the Hope River and traversed around Lake Sumner. By the afternoon, we'd left the Hope to follow the Hurunui River, where large chunks of the trail had been swept away by a recent flood. Though our elevation profile looked nearly flat, it soon became obvious that the terrain would be far from easygoing. We moved gingerly through the patches of brush we not-so-lovingly refer to as "thorn forest" -- 6 foot tall hedges with unfriendly inch-long thorns. Then we'd scramble up the steep, slippery bank of the river, edge across a washout, climb down to cross another stream, and repeat the process all over again. The 26-mile day ended with a steep climb up toward Harper Pass, where the trail had been completely washed away. We clambered up through a steep, damp forest on a use trail that was falling apart under our weight. From Harper Pass, Te Araroa follows the Harper River down as it turns from a tiny stream into a major waterway. By this point, there's no semblance of a trail. We look for markers every once in a while, but most of them seem to have washed away in the flooding. It doesn't really matter, though. We still have miles and miles before our route leaves this valley. At first, we slide our way down piles of fist-sized rocks and leapt back and forth across the river. As the valley broadens, we slowly made our way across fields of gravel, driftwood, and tumbles of river rock. This terrain is tough on the body and it takes a lot of concentration to keep moving. Sometimes, hopping from rock to rock is the only way to avoid the exhausting slog of our feet tipping and sliding with every step. As the river grows larger, crossing it becomes a more significant affair. At one point, with a large tributary coming in, our GPS line leads down the true right side of the Harper, but some errant markers suggest that we should cross to true left to ford the tributary separately. We make our best guess and follow the markers. The Harper is well over knee deep by this point, but the flow is manageable and we make it across without too much trouble. The tributary, however, is flowing fast and part of the channel is thigh deep on Jonathan as he crosses. It's not my favorite time to be short: the river hits me at the hip, which makes it a battle to make my way through the deepest section. The ford isn't wide, maybe 20 feet across, but it shakes me up a bit and I have to sit down when I reach the other side. Rivers are killers on this trail and we are way, way out in the backcountry. We haven't see another person all day. I clean the gravel out of my shoes and we take a moment, reminding ourselves to make good decisions and be careful in choosing the best spot to ford. 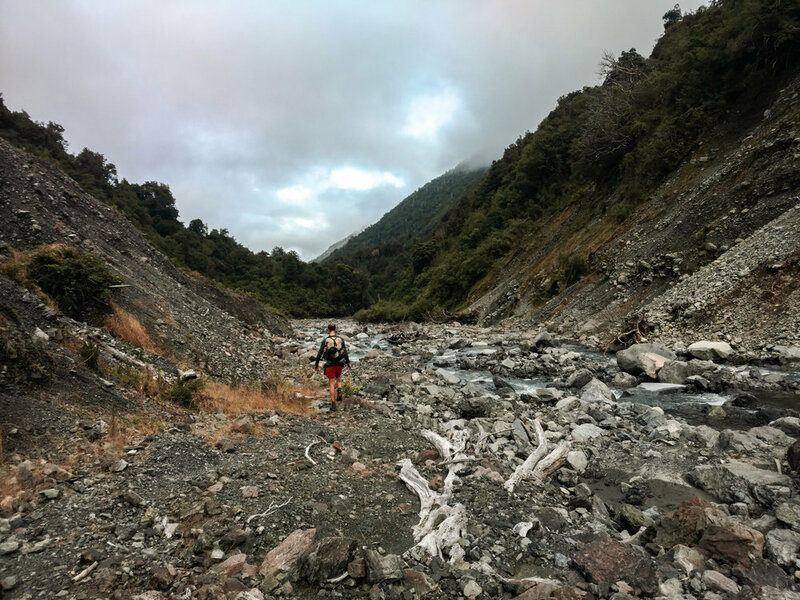 For hours and hours, we make our way down the Harper Valley, slogging through tussock fields and thorn forests, stumbling across jumbles of rock, and crossing more streams and rivers than we could possibly count. As the day wears on, we're plunging in and out of the water without even slowing down. By 3pm, we've covered about 15 miles and we are exhausted. We start to discuss our plans for the night. Our last weather forecast, now two days old, showed rain for the following morning. The rivers here can rise rapidly to dangerous levels, so a heavy rainfall could block us from carrying on up the trail or trap us between flooded rivers. A few miles ahead, we know there is a swingbridge where we can cross the now-massive Harper River and hitch to Arthur's Pass. Hitching out now, however, might mean skipping the next section of trail, the Mingha-Deception Track, which would take us up the Deception River and then down the Mingha River Valley. Meanwhile, a misty morning had become a beautiful evening. Our legs were worked from the tough terrain, but we're stubborn enough that hitching out in the sunshine felt a bit like giving up. We reached the bridge at 5pm and with wistful looks up the Deception Valley, crossed over and stuck out our thumbs. Without a recent forecast, we felt that braving a large rainstorm could put us in a nasty spot the next day. Only a couple of cars had passed us when a van stopped on the other side of the road. Another hiker hopped out, someone we'd never met. We took a break from hitching to chat him up and -- lucky us! -- he had a new weather forecast that looked much less dire. Adam, an Aussie who'd been living here for several months already, was planning to carry on up the trail to the next hut, 12km (~7 miles) up the Deception. He walked off toward the trail and Jonathan and I took one look at each other. We picked up our packs and crossed back over the bridge. A DOC sign read: "Upper Deception Hut, 8-10 hours." Chatting with our new friend, we began rock hopping our way upwards. Like all long-distance endeavors, thru-hiking is a mental challenge as much as a physical one. With some pretty evening light, Adam's enthusiasm (and fresh legs), and a goal in mind, Jonathan and I both got a strong second wind and powered up the rocky riverbed. The Deception valley is narrower than the Harper, and the trail was a bit better marked. The views had also improved: gushing waterfalls and glimpses back down the rugged valley. Still, we scrambled over boulderfields and washouts, and crossed the river again and again. It was nearly 9pm and just beginning to get dark as we spotted the hut through the bush. We forded the river one last time and climbed up to Upper Deception Hut, which was thankfully uninhabited. Adam, Jonathan, and I hung our headlamps from the rafters and lit the hut's candles. We changed into our dry sleep clothes and ate ramen by candlelight before falling into our bunks, completely spent. Upper Deception Hut sits about a mile and a half below the top of the Mingha-Deception Track at Goat Pass. We sleep in past 7am and make coffee -- a rare morning luxury -- before packing up. With the valley at it's narrowest, there's no trail up here and no option but the creek itself. It's drizzling outside and maybe 50 degrees, which feels a lot colder with your feet drenched in snowmelt. The creek is unbelievably beautiful, though, and somehow, we're having a blast. This is the TA... of course, we're climbing up a waterfall! In the US, even people who are experienced hikers rarely just go off into the backcountry with no trail to follow. But here in New Zealand, if you're not off trail some of the time, it's probably not "proper tramping" at all. Bushwhacking, or "Bush bashing" here, is surprisingly common, especially for hunters ("deer stalkers") who go into super gnarly, remote terrain (wild deer are a lot less common here -- in all our travels I've only seen farmed deer, though I've spotted lots of signs out in the wild, so I know they're out there). As soon as we reached Goat Pass, the terrain eased substantially and we even found some boardwalk over the marshland. The hike down went by quickly, and when we reached the highway, it didn't take long to get a hitch into Arthur's Pass to pick up our resupply box. We were only in town for a few hours, but we certainly made the best of it, spotting our first kea (the world's only alpine parrot!) and putting away 8 pies between the two of us. 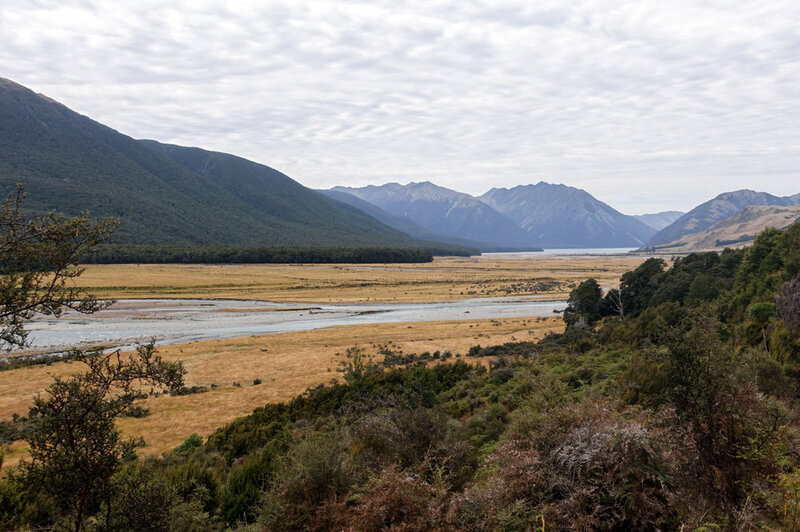 I've got a new working tagline for our Te Araroa thruhike, and I think it's a pretty good rule to live by in New Zealand: "Cross all the rivers; eat all the pies."